"I wanted this relationship so much. But after Susan agreed to marry me, I felt smothered. I could only think of getting out." "I longed for this job, then I quit after a month. I couldn't stand being hemmed in." "I looked at cars for weeks and was sure I'd found the perfect buy. But the next morning I felt I'd made a terrible mistake." Do you find it difficult to make commitments? Even harder to live up to them? After you give your word on something, are you plagued with second thoughts? Do you dread completing projects or actually reaching a personal goal? "Smith does an excellent job helping readers tame the fear of commitment in their lives. Although his primary audience is Christians suffering from chronic commitment anxiety, he also targets people with less serious struggles. "Smith's approach is practical and encouraging. Using real-life and biblical anecdotes, he shows how fear affects almost everyone. People dislike losing freedom and assuming new obligations; thus, 'commitment fear is at heart the dread of losing control.'" "A main theme is Smith's belief that God gives people right opportunities, not perfect ones. He says it's unrealistic and distressing to expect perfect certainly about God's will in decision-making. Other topics include learning the value of tradeoffs, understanding phobias, overcoming fears of success, managing mood swings and runaway emotions, and dealing with mixed signals about inward guidance and intuition. In the final section Smith addresses commitment's benefits, which when emphasized, help defuse fear in careers, relationships, and spiritual life." Even if it has been difficult in the past, you can learn to say yes and mean it. And enjoy the extraordinary benefits of commitment! 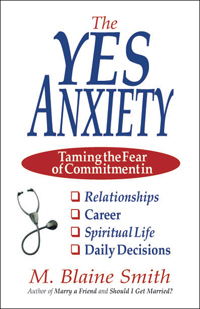 This is the original edition of The Yes Anxiety, first published by InterVarsity Press in 1995, with just a small number of minor corrections.